These are not very easy species to acclimatize. It is possible to keep one small specimen at most, which will often live away from the light. They are herbivores that sift the substrate looking for algae to eat. In among the prickles it is possible to see the articulated pedicellariae, which end either in a tiny pincer for trapping food or a sucker. The latter allows sea urchins to develop on rigid supports or the glass sides of the tank. 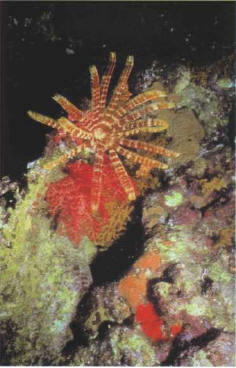 Some species of sea urchins with varying sizes of prickles can be found in marine aquariums. These are not recommended for a marine invertebrate tank, as they attack other species, such as sponges. Starfish are in fact either carnivorous, gripping their prey with their long arms that emerge from a central disc, or microphages, in which case they feed on small organisms on the bed. The ophiuroids, sometimes called brittlestars and closely related to starfish, have articulated arms which allow them to move around quite quickly. These arms, like those of the starfish, can regenerate themselves if they break off. УЛЬСКИЙ АУЛ (ныне аул Уляп Шовгеновского р-на Адыгеи) , близ которого расположены курганы скифских вождей 6-5 вв. до н. э. с оружием, золотыми украшениями в зверином стиле, конями (в самом большом кургане 410 костяков лошадей).